You are here: Home » Games » FIFA 13 » insomnia48 | Headline FIFA 13 1v1 Tournament Announced with £1,000+ in Prizes! 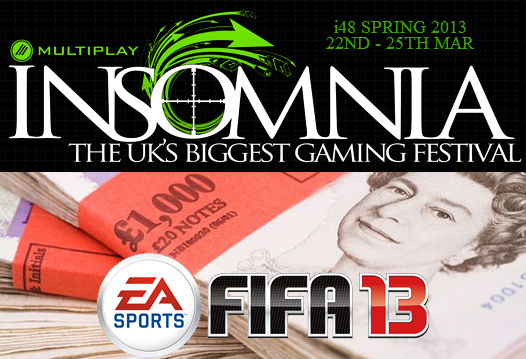 insomnia48 | Headline FIFA 13 1v1 Tournament Announced with £1,000+ in Prizes! Before you all go off to the holiday season (and eat drink, be merry and practise FIFA 13 of course), our partners at Multiplay UK thought they would give you some food for thought from the Multiplay eSports department! 2013 is going to be amazing, with some of the biggest eSports tournaments in the UK ever! insomnia48 will host loads of awesome tournaments as usual, including the better than ever FIFA 13 Pro 1v1 Tournament. If you like the sound of one of these tournaments next year, then make sure you take advantage of the Early Bird offer (20% off for BYOC attendees!) by visiting the i48 tickets page and buying yours now! FIFA 13 is playable on a BYOC ticket, but only requires at least a TUP (Turn up and play) ticket to take part. Sign ups will open in the new year, so keep an eye out for that! insomnia48 (i48) runs from 22nd March to 25th March 2013 at the Telford International Centre and your Sweetpatch TV team will be there running all the FIFA 13 activity for you. insomnia48 | The End is iSeriesly Nigh!